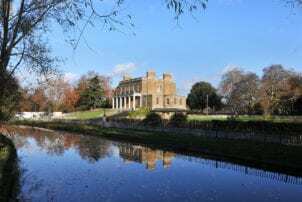 Clissold House is a stunning Grade II* listed space set in the tranquil surrounds of Clissold Park and is available for a range of weddings and private events. This eighteenth century mansion house offers expertly restored architecture, beautiful interiors and a stunning outdoor terrace. Recently refurbished, this space is a stunning setting for a range of events. The large ornate windows flood the space with natural light and offer guests exceptional views across the park. Original features such as marble fireplaces and the iconic spiral staircase ensure a breathtaking experience. The house offers two main rooms on the first floor with outdoor terrace. The Drawing Room, Dining Room and adjoining Hallway are perfect for the most stylish of weddings, providing space for a ceremony followed by a seated dinner or standing reception. The second floor comprising the Church Room, New River Room and Dressing Room provides further space for smaller meetings and intimate gatherings. The in-house events team is on hand to assist with all pre-planning and set-up and to provide that vital support on the day making any special occasion a truly memorable event. Book this venue or let us help you find more perfect Venues in North London for your event. Name E-mail Phone Number What kind of venue are you looking for?